VW brand now profitable in U.S.
Browning: "The focus is on meeting our contribution to the corporate profitability target." 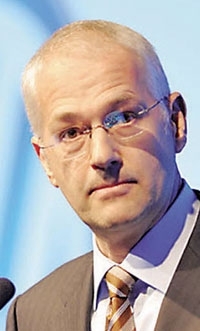 DETROIT -- The Volkswagen brand expects to be profitable in the United States this year, Jonathan Browning, CEO of Volkswagen Group of America, said. "Audi brand achieved profitability in the U.S. last year," he said today outside a Society of Automotive Analysts conference in suburban Detroit. Browning cautioned that he was talking only of the VW sales operation not including U.S. manufacturing, financial services, or VW's contribution to global fixed costs. Volkswagen AG this spring opened its new U.S. manufacturing plant in Chattanooga, Tenn. He did not offer specific figures. "The focus is on meeting our contribution to the corporate profitability target," he said on the conference sidelines on Wednesday. "But this is a significant improvement." One part of Volkswagen Group's 2018 goal is an 8 percent profit margin. But Browning noted VW has not turned a U.S. profit since 2003. VW Group's U.S. sales, through August, rose to 284,978 vehicles, a 19 percent gain over the same eight months of last year. Industrywide sales increased 11 percent over the same period.